-Complimentary use of golf cart and practice balls. On the east coast of Mauritius, where the blue lagoon of the Indian Ocean gently laps against the shores of the island, lies Anahita The Resort… majestic, refined and unique. Set amongst 213 hectares of tropical gardens and surrounded by an Ernie Els designed 18-hole golf course, Anahita The Resort is nestled on the east coast of Mauritius. 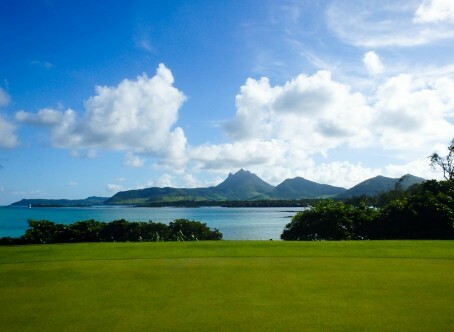 Set between land and sea, this challenging golf course is a 6,828-meter, 18 hole, par-72 championship course with large fairways and five sets of tees.Built to USGA standards, it is the first of its kind in Mauritius. Six stunning ocean front holes culminate in a final shot that is among the most spectacular in the world. Carefully woven into the tropical sanctuary, the course is set against lush mountains and fringed by a vast crystal-clear lagoon. The Golf Academy specializes in improving the game of guests at all levels of ability, from complete beginners to scratch players. Whether your goal is to learn the game, lower your handicap or win a club championship,the Golf Academy can help you with your achievement. evening an appealing selection of delicious traditional Italian dishes and wines. A delightful selection of dishes from the «In Suite dining menu» can delivered to the suites and villas. sandwiches, pizzas, pastas, grills and an assortment desserts for lunch. Domain de l’etoile restaurant is situated 15 minutes from the Resort, in a natural and gorgeous scenery. Our Space kids club welcomes children from 8 months to13 years everyday from 08h30 to 20h00. Access to the club is free of charge for children from 4 to 13 years (excluding meals). It is managed by qualified nannies with recognized childcare qualifications. The activities include kayaking, tennis sessions, trips to lle-Aux-Cerfs, snorkelling, glass bottom boat outing. water-ski are available on complimentary basis. Located on the first floor of the Golf Club House, the Fitness Centre is fully equipped with cardiovascular and weightlifting equipment. Mauritius, a beautiful island of 1800 km2, is located in the Indian Ocean, off the eastern coast of Africa. The average temperature during the summer months (October to May) is approximately 28°C, with a water temperature of 24°C. The sub-tropical winter months (June to September) are as beautiful as summer in Europe. Approximately one million inhabitants of different origins live peacefully together, creating a melting pot of cultures, religions and languages. Sugar Cane, Textile Industry and Tourism are the three major sources of revenue of the Mauritian economy. English is the official language of the island, although French is widely spoken and used everywhere. No visa is required to enter Mauritius for EU national. A valid passport and a return plane ticket are essential. No vaccination is needed. The following credit cards are accepted in the hotel: Visa, American Express, MasterCard, Diner’s Club. Mauritius is 4 hours ahead of Greenwich Mean Time (GMT+4). Anahita The Resort is located 45 minutes from the airport.